Has the HBK line gone into cardiac arrest? As great as the Pittsburgh Penguin's top line has been recently no matter who is on it or what name you give it, the same cannot be said for the now legendary HBK line. It seems to be on life support and fading fast. The magic that was the biggest storyline at the end of the 2016 regular season and into the NHL Playoffs seems to have disappeared and with that so did the goal scoring. Since the start of the 2016-17 season, the HBK line of Carl Hagelin, Nick Bonino and Phil Kessel has struggled to stay alive. In the (just over) 200 minutes played together, they have only produced four goals, a true decline from the 12 goals they produced in the 144 minutes they played in the final stretch of the regular season last year. Their combined shot percentage has dropped off dramatically (at last check it stood at 3.88%) and the chemistry that was once flowing like Niagara seems to have dammed to only a trickle. As bad as things look both on paper and on the ice, all is not entirely broken. In fact, when the pieces are separated, they contribute more to the whole. Taking a look at the obvious, Phil Kessel continues to prove his elite level status within the NHL. When placed on another line, the Penguins are averaging 3.60 goals per 60 minutes. Kessel's shot percentage of 11.2% has lead to 15 goals in 48 games played. He is a player that can not only score but can make plays happen, as evidenced by his 31 assists. Carl Haglein and Nick Bonino are another matter. The Penguins have gotten by with Hagelin in his slump. When he is not combined with his usual line mates, the Penguins are still scoring at a rate of (roughly) 3.29 GF/60. He is having a bit of an off year and his usual swagger seems to be missing but all is not lost on the speedster. He sits at a +8 and a shot percentage of 5.8 (104 shots over 48 games). He just isn't getting the "puck luck" as it seems. The same cannot be said for Bonino. It has not been a good year so far for the man they call "Bones", which seems fitting as right now he seems to be dead in the water. His GF/60 is terrible (approx. 2.24), he sits at a -6, and his 8.9% shots on goal stat is reflective of only 79 shots on the net. To put that in perspective, Bryan Rust has one less shot on goal than Bonino (78) and a shot percentage of 15.4. Of those shots, 12 have resulted in a goal. Out of 79 shots, Bonino has only 6 goals. On the backside of that, Hagelin has a lower shot percentage than both of them, but also has more shots overall. Bonino's saving grace has been his worth on the power play and penalty kill. He has been one of the best on the team when it comes to blocked shots (currently fourth with 64), however that is a reflection of how much the Penguins have ad to play in their own zone as of late. To put it simply, the overall production from Bonino is lacking and not showing signs of getting any better. With the numbers in the Metro Division being what they are, turning it on at the start of the playoffs is not an option. 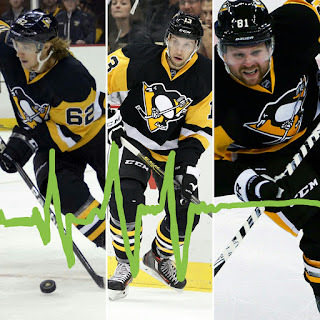 The lack of spark on the HBK line may not seem like a big deal right now, but having four high functioning lines was the key factor in the Penguins' success at the end of the last regular season, into the playoffs, and ultimately, in the Stanley Cup Final. The team leads the league in goals with 170. They are also first in goals per game (3.54) even with the sputtering HBK Line. The Penguins' also stand in fifth both in power play percentage (22.8%) and in team shooting percentage (10.3%) . They are also second in the league in power play goals (38). With the help of Evgeni Malkin, Sidney Crosby, Conor Sheary and even role players such as Eric Fehr and Chris Kunitz, the Penguins are still managing to fill the net relatively well. They are winning games even if it means coming from behind to do so. It will take a full team effort on the offensive and defensive side if the Penguins hope to win back to back Stanley Cup Championships. All the pieces have to fit together and when it comes to Kessel, Hagelin, and Bonino, they just aren't anymore. Could the low production play a factor with the looming trade deadline? Is this the end of the HBK line or can the spark be reignited? The season is coming upon a time where every point matters. The playoff standings in the Metropolitan Division is tighter than ever. Decisions have to be made for the good of the team and their hopes for a deep run in the post season. How it all pays out from here is anyone's guess. excellent article, I'll be following from now on! I love your analysis of the HBK line but truth is those are our clutch cup chasing sleepers, which is why we still love them so much despite their struggles. Why thank you. I understand your POV on them being "sleepers". Thank you for reading hope you will find other articles just as enjoyable.